Considering where we started, that is a teeny little list. It may or may not all get done this fall, but we are at least weather-tight and ready for the rain now. 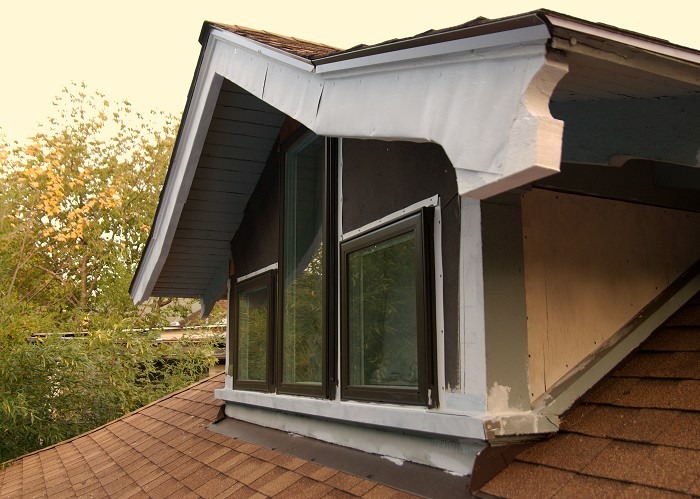 The lazy (but fast) way out of the mess of a back dormer…covering it with metal! Just want to say your house is amazing! We just started a home renovation contest and I hope you’ll consider entering. All you have to do is upload before and after pics along with a short summary for the chance to win up to $2700. Did you post somewhere what the final choices on your trim and accent colors were? I don’t find them tagged under bungalow paint colors. Anyway, I’m curious. I like your choices a lot. I know you went with caponata for the body color. Post them all if you get a chance and sorry if they’re here somewhere and I didn’t find them. Thanks. The body color is Caponata. The trim color is Jicama. And the pumpkiny accent color is Firenze. 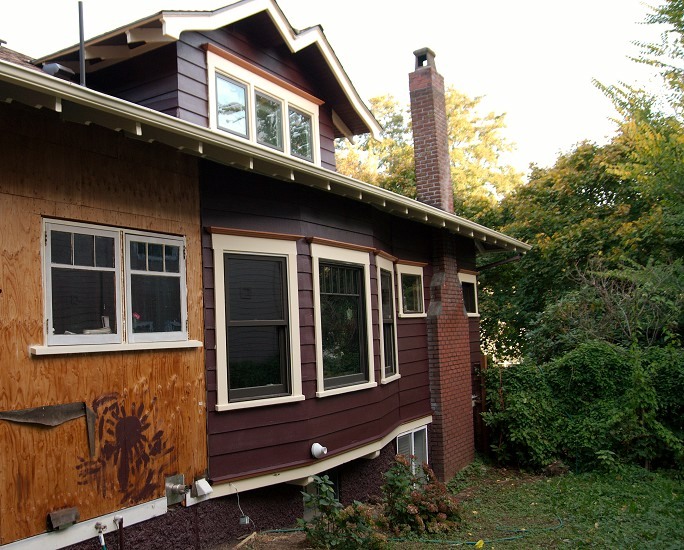 When we bought this house, previous owners had removed most of our original windows and replaced them with plate glass or aluminum sliders (it varied from room to room). 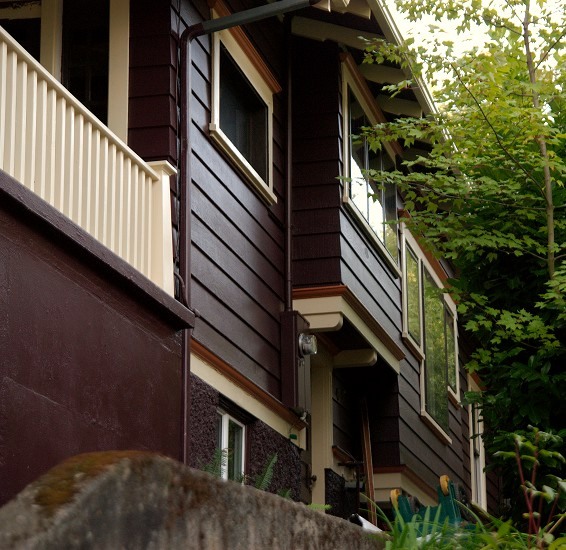 We replaced the replacement windows with metal clad wood windows in a bronze finish. But we still have a handful of original wooden windows. We wanted them to blend in with the new ones, so we painted those with Bejamin Moore’s IronClad latex metal enamel paint in “Bronzetone” which was a really good match for the metal windows. 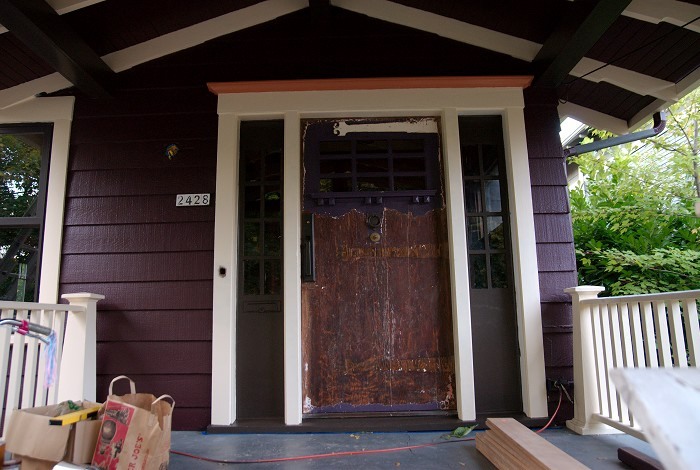 We’ve used that color a couple of other places as well – on the sidelights flanking the front door and on the porch roof beams. I meant to say earlier that the covering of the dormer rafter with metal was a nice solution to that problem. I’ll bet no one notices from the ground that it’s anything out of the norm! The house in the picture looks so nice. I want this type of house to my son! Guys just have to say what an amazing job your doing. Just spent a bit of time reading all about what you’ve been doing. I love some of the before and after shots. Looks amazing Steph! Love the colours you chose. Absolutely blown away by the beautiful colors! It was definitely worth looking outside strictly historic color palette. Would love to know more about your color consulting. Please, feel free to email me! Next Next post: Bungalow Insanity in the Wall Street Journal!